In 1910 the Society for the Promotion of Technical Education in Bengal which looked after Bengal Technical Institute (which later became College of Engineering and Technology, Bengal) was amalgamated to NCE. NCE henceforth looked after the College of Engineering and Technology, Bengal which by 1940 was virtually functioning as a University. After Independence, the Government of West Bengal, with the concurrence of the Govt. 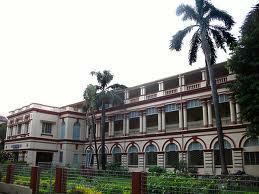 of India, enacted the necessary legislation to establish Jadavpur University on the 24th of December 1955. Placements: Though attachment to a factory for a specified periodic not a precondition for an Engineering Degree here, adequate arrangements are made for intensive factory visits and vocational training at the factories. As the graduate programme is completed the students are recommended to various firms and establishments who want qualified young people for their organizations. Campus: To trace the history of Jadavpur University is to trace a part of India’s freedom movement, at least from the Swadeshi Movement onwards. It was 1905 -1906. Central library: adavpur University Library was started along with the establishment of the University in 1955 in order to cater the academic and research needs of the faculty, research scholars, students, officers and non-teaching staff. Since then, the University Library has gone from strength to strength to live up to the expectations of its immediate clientele. It is one of the best-equipped libraries in the country. The University is proud of its library system, which comprises the Central Library, Salt Lake Campus Library, 33 Departmental Libraries under the Faculty of Arts, Science, Engineering and Technology, and also the Libraries attached with the Schools and Centres for studies. The Central Library of Jadavpur University is one of the central facilities used by all types of members of this University. This is the third largest library in West Bengal. Rabindranath Tagore was the most illustrious member of the Committee of Ways and Means formed in 1905 to set up the National Council of Education (NCE), which finally evolved into Jadavpur University in 1955. The university has decided to celebrate the 150th Birth Anniversary of Rabindranath Tagore, which falls in May 2011, in a befitting manner, with year-long celebrations lasting from May 2010 to May 2011. The celebrations began with a simple programme on the 10th of May 2010, where the distinguished speakers included educationist and linguist Professor Pabitra Sarkar, author and academic Professor Samir Rakshit and poet-educationist Shri Aaloke Sarkar. Professor Pradip Narayan, vice-chancellor of Jadavpur University, welcomed all the guests and presented an outline of the year-long celebrations planned by the university. Professor Sukanta Chaudhuri, professor of English and director, School of Cultural Texts and Records, JU, gave a brief demonstration of the variorum e-text of Rabindranath’s play Bisarjan, which contains all the textual variants of this work. This is the first such venture for any text written by an Indian author in an Indian language. A CD with a demo version of the variorum e-text was released on the occasion. Smt. Chitralekha Chowdhury enthralled the audience with her rendition of Rabindrasangeet and the evening came to a moving conclusion with the presentation of Rabindranath’s play Raktakarabi by the visually-challenged performers of the theatrical troupe Anya Desh.